I was about to publish yet another tweet on my Twitter account where I’m tweeting the most commonly used English phrases, idioms and collocations. As always, I started writing a sample sentence containing the idiom “on the off chance” – just to give my Twitter followers a general idea of how this particular expression is used. I’m sure you’re familiar with the feeling when you say something in English, but it just doesn’t seem right, aren’t you? This “gut feeling” develops along with your English fluency, and it can be explained by highly developed contextual links among English words in your inner vocabulary. Speaking in simple terms, it means you’ve heard and used certain English phrases so many times that you intuitively know in what context they’re normally used. But how to make sure I get it 100% correct? Obviously I can’t just chance it; what if I publish some non-sense on my Twitter account and my fellow foreigners start speaking incorrect English just because I taught them so? Not that I’m some sort of a perfectionist when it comes to speaking in English, it’s actually far from it! However, as far as my professional activity is concerned, I just can’t afford to be lackadaisical and publish English content that I’m not so sure about. In situations like this, Google search suggestions is an invaluable tool. It takes just a few seconds to ascertain the truth, and here’s exactly how it’s done. 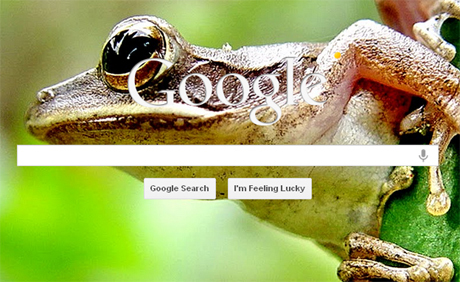 So, are you wandering what such a simple Google look-up can reveal? You have to use quotation marks so that only exact matches are returned. You have to compare the number of search results returned so that you can see which one is most likely used in spoken English. For more thorough understanding of how the particular phrase is used, look out for the highlighted results and see how that phrase is used in the context. 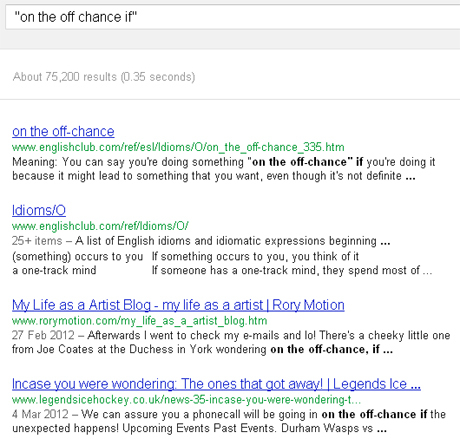 As you can see in the image above, the phrase “on the off chance that” has about 120 time more records on Google than “on the off chance if”. It’s a pretty definite indication of the former one’s prevalence in the spoken language! Now, I can be 99.9% sure that native English speakers use the phrase “on the off chance” followed by ‘that’ instead of ‘if’, and that’s exactly what I’m writing in my tweet’s sample sentence. On many occasions though, both options can be used depending on the context. That’s why we have the third point in the above list, and it says something about looking at the highlighted Google search results, doesn’t it? If I read how that phrase is incorporated into the surrounding context, it becomes quite clear that it’s incorrect English. 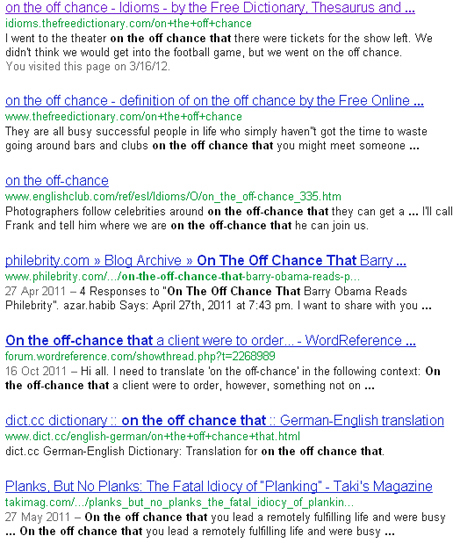 Those comparatively few Google entries containing the phrase “on the off chance if” have most likely been created when writing very quickly, without much consideration. Also, at least two entries on the first page have a full stop between the words: “on the off chance. If”. 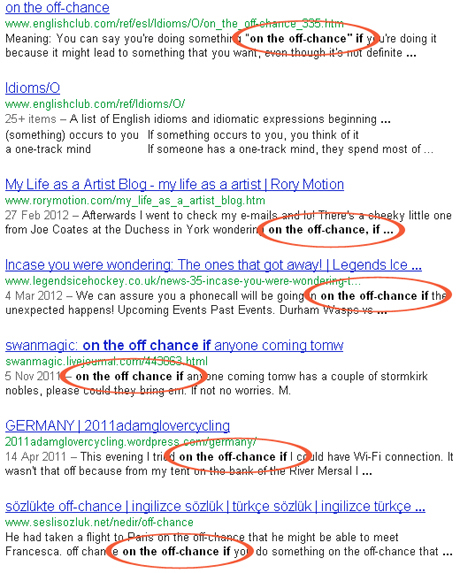 It can only mean one thing – once Google couldn’t return sensible, viable sentences containing the phrase in question at least on the first search results page, the phrase “on the off chance if” isn’t something that’s used in natural, spoken English. So, this is how you can use Google to figure out how exactly certain English idioms and phrases are used in the English language! Have been doing such a thing intuitively before, but mostly for the single words. I also use Google regularly to get a word definition using “define” or “definition” keywords paired with an actual word.